Moscow’s CSKA has played a number of matches behind closed doors as punishment for its racist fans. Is the club finally starting to take notice? “We light up the football,” Russian state company Gazprom proclaims in its ubiquitous TV spot for Champions League soccer, the result of a costly sponsorship deal with governing body UEFA. The colorful cartoon ad centers on a vast stadium packed with rejoicing fans, just what you would imagine happening when English Premier League champion Manchester City arrives in Russia next week to face CSKA Moscow. That won’t happen, though. Even though a win is crucial for both teams after they started the group stage poorly, there will be no fans in the stadium. UEFA has decreed that Arena Khimki, just outside Moscow, must remain empty for the game as part of CSKA’s punishment for racist behavior and violence by its fans during a defeat to AS Roma last month. 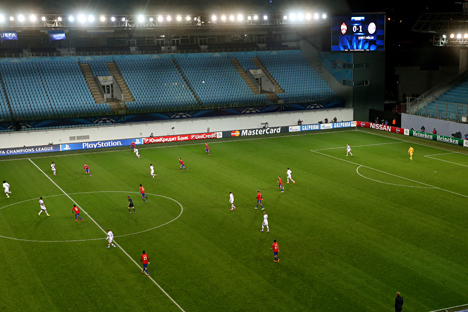 This will be the second empty-stadium match for CSKA this season. The first, against Bayern Munich earlier this month, was a strange affair, silence punctuated by the clicking of journalists’ keyboards, while faint chants from CSKA fans protesting outside the stadium lent a ghostly feel. Many supporters in Russia and elsewhere are up in arms. Why, they ask, should thousands of law-abiding fans of CSKA and City be punished because a few dozens idiots waved far-right banners and attacked Italian police? Surely CSKA should be given the chance to sort its fans out? The only problem is that CSKA has been given chances, and plenty of them, but hasn’t been able to solve the problem. This sorry streak started when its fans tormented Man City’s Yaya Toure with monkey chants a year ago and the club was forced to close one stand of its stadium for its next Champions League match. That game fortunately passed without incident, but the same could not be said of CSKA’s following trip to the Czech Republic. At Viktoria Plzen’s stadium, a group of CSKA fans festooned their sector with extreme right-wing banners in apparent protest at the first UEFA ruling – effectively daring the governing body: ‘You can’t keep punishing our club.’ But UEFA did, forcing CSKA to play one match – this season’s recent encounter with Bayern – in a completely empty stadium. But that wasn’t all. In their club’s first European game of this season, away to Roma, fans earned CSKA the biggest anti-racism punishment ever handed out to a major Champions League club – three home games in an empty stadium, and two away games with no CSKA fans to be admitted. The punishment seems harsh for the majority of fans, but really, what else could UEFA do? Three offenses in less than a year is no fluke – it suggests a deep-set malaise at CSKA. That is an irony for a club which until recently had one of the best records in Russia on tolerance and most of whose fans adore its black players past and present, like Brazilian striker Vagner Love or Ivorian forward Seydou Doumbia. There are questions about CSKA’s management, too. The club has yet to issue a clear statement condemning its out-of-control minority of fans, focusing instead of appealing the latest UEFA ban. Last year, management responded to allegations of monkey chants by issuing quotes in Doumbia’s name saying there was no racism. The only problem was that Doumbia denied ever saying anything of the sort. With four years to go until Russia hosts the World Cup, racist incidents are much more common in Russian football than in most other major European leagues. Sometimes, they simply go unpunished, but recently the Russian Football Union has started to crack down, which is a good start. Unfortunately, some of its punishments have sent out mixed messages. Last month, Dynamo Moscow’s Congolese defender was so upset by intense monkey chanting from Torpedo Moscow fans that he was unable to keep playing. The RFU handed Torpedo a partial stadium closure for its next month, but banned Samba for two games for an “unpleasant gesture” at the people who had racially abused him. That is not to say that there are no signs of hope. CSKA’s litany of offenses and punishments has roused an anti-racist movement among its fans in recent weeks. The result, as yet, only exists online – as a Facebook group of around 1,600 people – but it shows promise, cooperating against what administrators label “this evil” of racism with the respected campaign group Football Against Racism in Europe. The CSKA anti-racism campaigners also highlight what they see as double standards in coverage of racism, that incidents in Russia are covered in more detail in western press than those in other countries, especially Ukraine. While there is something in this – some recent racist incidents involving fans of Ukraine’s Dnipro Dnipropetrovsk have, in my view, been underreported – Russian fans need to recognise that hosting the World Cup puts their country’s football in the spotlight as never before. In order to shine at the World Cup in four years’ time, Russia doesn’t just need a world-class team. It needs world-class fans too. CSKA’s anti-racist fan campaigners are on the right track, but they have much work to do.